Eh. Well. It was okay (supposedly better than Snow White and the Huntsman, though I still have to watch that one to find out). The plot is basically revealed in the trailer: someone changed history and killed Agent K, Agent J is concerned, then time travel happens. To be more specific: this creepy high-profile criminal alien (called “Boris the Animal”), who also happens to be the man-boss of Nicole Scherzinger, breaks out of LunarMax Prison (aptly named because of its location on the moon) with the intent to get his missing arm back and to kill the reason for his imprisonment —by going back in time. While Agent K and Agent J go through serious relationship issues caused by Agent K’s emotiveness and sentimentality (or lack thereof), Boris the Animal the alien acquires banned time travel technology from a techie guy manning a store. That night, with Agent K preparing to be killed by the escaped Boris, a pulse goes through the space-time fabric. Agent K has been killed. In 1969. For some reason, only Agent J (Will Smith) remembers that Agent K existed in 2012. With the help and support of a convinced Agent O (and there was a love story there, somewhere, between O and K), he acquires time travel tech from the same guy and jumps from a tall building. He’s in 1969. Now there are two Boris (the one with 2 arms/ the 1969 version, and the 2012 travelled back in time version), one young deadpan Agent K, and Agent J (who is black in a hilariously prejudiced America). Boris version 1969’s mission is to open up the earth for an invasion. Boris version 2012’s mission is to stop the hacking off of his arm and to kill Agent K. Agent J’s mission is to stop (read: kill instead of imprison) Boris 1969/2012 and to save the world. There’s also a cute fifth-dimensional last-of-his-kind alien who can see the past, present and future of alternate infinite realities who helps them out. His name is Griffin. (Just skip everything except the summary). There are very few things that remained with me after watching MIB 3. “Bogladites” (the race of Boris) was one of them (for the reason that it sounds funny); other things simply slipped –we didn’t spend the car ride home nitpicking the movie, or raving about the jokes. MIB 3, like it’s predecessors, wasn’t a movie that stuck after the credits (indeed, I can’t even recall any key points to the plot of the previous movies; I only remember laughing). It was enjoyable and worthwhile, but not something I’d actively seek to watch again. Nevertheless, it did not disappoint (the unsurprisingly lukewarm expectations I had). It had good lines and a solid plot that made the old franchise relatable and still funny. The main duo, Will Smith and Tommy Lee Jones, are as dysfunctional as ever, with added depth to their relationship (about time, since it’s been more than a decade). Agent K’s deadpan expression (even in his younger version) still amuses the crowd, and J’s free spirit action and witty commentaries were especially striking in 1969 America (the references to racial segregation were [inappropriately?] hilarious, and also very true). Josh Brolin delivered a younger Agent K with the pragmatism, pauses, and deadpan, unflappable attitude that Tommy Lee Jones brought in the 90s. In terms of effects, aliens and general kickassery, MIB still delivered real sci-fi deals (even with Lady Gaga in the background). While it did have appropriately funny lines and a solid plot, several things were predictable or slightly off-key. The villain’s characterization was admittedly flat, and limited to a tagline (“It’s just Boris!”) and to a motivation that took a handwave explaining. Well, it’s not that big of a dent, seeing as how MIB was never about character development of villainous aliens and was more of action. The attempt to instill some evolution was there, though, with the (un)surprising revelation at the end about Agent J’s family history. I can’t say that wasn’t unexpected, since I pretty much guessed it from the not-so-subtle foreshadowing. Some questions were also left unanswered, or maybe I just can’t wrap my head around time-travelling business as well I thought. In summary, it’s a nice movie to watch in between The Avengers and The Dark Knight Rises/Amazing Spiderman. 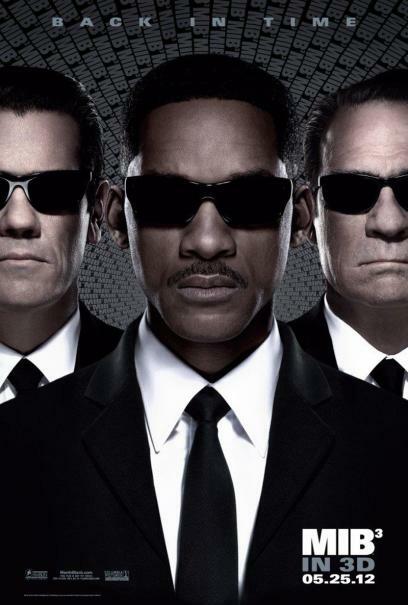 Funny, full of nice explosions and alien fighting tech, with an added bonus of vintage fashion –Men In Black 3 is worth watching, though not necessarily worth remembering.